He's back! Where you at, Tiger Woods fans? 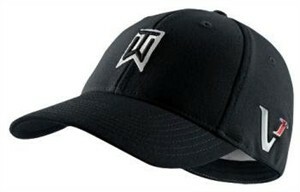 Here is the 2010 Victory Red Tiger Woods logo hat. Although 2010 may be a year Tiger wants to forget, I think the golf world will always remember this crazy one. No, this hat does not come with a phone number of a beautiful cocktail waitress (you have to get that on your own), nor is it reinforced like a batting helmet in case an angry model comes at you wielding a sand wedge. What it does contain is a flex fit that fits most head sizes comfortably. It has the "VR" Victory Red emblem on the side, just like Tiger wears. The ONE logo on the right side, and of course the "TW" logo on the front that stands for Testosterone-filled Womanizer… Heyyyooooo. Okay, enough of my David Letterman routine. It's a cool hat and is identical to the one Tiger wears. (Well, perhaps his is specifically sized for his head.) But other than that, nobody can tell the difference. Whether you're a fan or not, the hat will certainly be a conversation starter at your next round of golf. That is for sure.